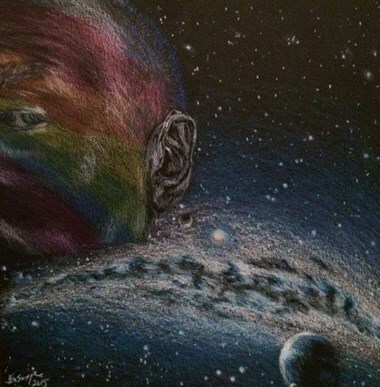 [Image Description: A portion of a man's face, tinted with rainbow colors, floats in front of a panorama of a galaxy, stars and planets in outer space. A hearing aid is in the man's left ear.] Work by Eddie Swayze. The bulk of the editing work for the prose in this issue took place in New York, but in these waning hours of production, I find myself writing my editor’s introduction in a far more horizontal space, the suburban Houston house of my in-laws. It’s fitting enough to be here, not there, since there is a word has been rattling around in my head the entire time I’ve been meaning to write this introduction, and that word is one I often mistakenly apply to the landscape of my wife’s home state. It’s a word that appeared in our own collectively written manifesto, published on Drunken Boat at the end of June. While a collectively written document ideally has no language with a single owner, this word--”void”--is one word that I want to take ownership of, and to think about briefly here in the context of our five excellent prose contributors. In the manifesto, we wrote, of our mission: “We will help create access where there had been a barrier, language where there had been a void.” The response to this line, as to many lines in the manifesto, was positive. Most readers we heard from recognized the aspiration, the call to action that we saw as just the latest in a long line of such calls reaching back to “The Preservation of Sign Language,” or farther. A few readers, though, found the word to be a slight, invalidating the work of writers, editors, curators, anthologists, scholars, and--most importantly--readers and viewers who had come before us. I am pleased about so many aspects of the prose fiction, nonfiction, and genre-blending works presented in our first issue: these works are inventive and transgressive, sly and wry, speaking to individual aspects of the disabled experience in ways that are accessible to so many in our community, exploring notions of trust and safety and wealth and autonomy. What I might be most proud about is that our upstart magazine has already incorporated the voices of different generations of disabled writers, from the emerging to the established, from our very first issue. Our prose section distills this perfectly. It includes two writers who also have both poetry and books being reviewed--something I call The Deaf Poets Society Triple Crown. (Nobody else seems to think this is funny.) Joking aside, this situation, I think, speaks to two important aspects of a community-based magazine, the first of which is that the world can be small. The other takeaway from our Triple Crowners is this: that as excited as I and my fellow editors are, collectively, to get in the game--as we wrote in the manifesto, “We are here to right literature.”--it’s impossible to do so without pausing to recognize that there are writers who have preceded us in this work. I knew that--as we all did--when we came to consensus upon the words, including “void”. How could we know all that and still use that word? In the week after the manifesto’s publication, I did some thinking about where “void” had come from. I remembered feeling the “click” I have come to recognize, when it happens while writing, as meaning “right word, right place” in my atypical brain (laser-marked, scar tissue-carrying). What had I envisioned when that word came into my mind, onto my fingers, into my Chromebook, and, finally, our manifesto? Imagine a large space between two sides of a canyon on a dark night. In that space there is quiet, and there is stillness, there is darkness and there is mystery. But there is not absence. There is not even a lack of knowledge. There is not nothing there. It is a space where someone not paying attention could think that is so. The space between sides of the canyon might well be the one occupied by disabled writers; the people not paying attention might well be the producers and consumers of disabled characters through much of literary history, looking straight through what they’ve never learned to see; the notion that there is not nothing there is clear in the impressive, gorgeous work that many of the writers in this first issue have done prior to their publication here. A canyon is a canyon because there is a gap between sections of land, and that a long way down, there is flowing water. The water isn’t immaterial, but what gives the canyon its definition is the space between landmasses: the void. But that’s not, I think, in the end what caused the “click” for me, not with that word, not the noun form of it anyway. The notion of recognition, of being hidden in plain sight, is a thing folks with disability -- for me, anyway, as a person who’s experienced chronic illness and neurodivergence -- grapple with. That definitely informed my image-making there, and if I wasn’t as precise as I could have been in the manifesto, what made it escape me and our larger group is both the truth behind the experience of feeling hidden in plain sight, and the notion that this word appeared in a call for action. Because there is another kind of void, and it’s an action. The verb that is the word void declares something invalid, not bound by law or custom. And it’s that action that is the crucial struggle of a moment when some lives are clearly worth more than others, a moment when the systems of government are not serving all equally, a moment when the very mechanisms of civic life are under pressure that may make them warp, bend, break. It is this sort of void--these invalidations and erasures, these white-washings and airbrushings--that our contributors’ work refuses. It is this sort of refusal that can only come from art by a community, for a community. Art like the work you’re about to read. Enjoy it. Prepare to be moved.